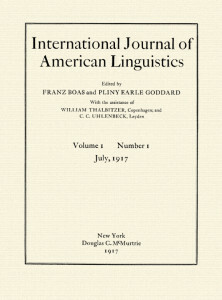 The International Journal of American Linguistics is dedicated to the documentation and analysis of the indigenous languages of the Americas. Founded by Franz Boas and Pliny Earle Goddard in 1917, IJAL is an important repository for research based on field work and archival materials on the languages of North and South America. 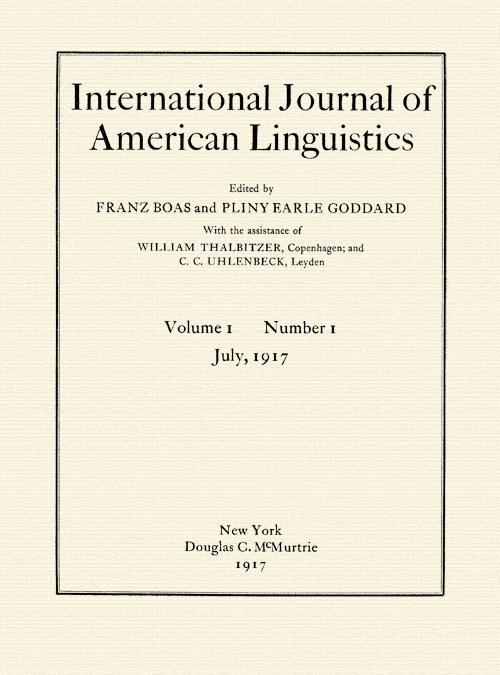 Articles appearing in IJAL may result from general descriptive work on a language, but typically focus on aspects of the language analyzed within one of the sub-disciplines of linguistics—phonetics, phonology, morphology, syntax, or semantics. We also encourage submissions in the areas of sociolinguistics, anthropological linguistics, and historical linguistics, as well as areal and typological studies. Articles may be written from any theoretical perspective, as long as the author offers an original, well-argued, and clearly-presented analysis, and the paper incorporates substantial empirical data that will be of value for the documentary record of the language. Papers may be submitted in either English or Spanish. Also available, full issues from the Native American Texts Series.